Bertha Margaretha Huffman was born 3 August 1897, the daughter of Jacob and Mary (Kessler) Huffman. She was baptized by Rev. August Affeld on 29 August 1897 at Zion Lutheran Chatt, with Christian Kessler and Margaretha Kessler serving as her sponsors. She was confirmed at Zion Chatt on 9 April 1911 by Rev. George Haas. Bertha was not mentioned in Zion Chatt’s records again until her death in 1977. 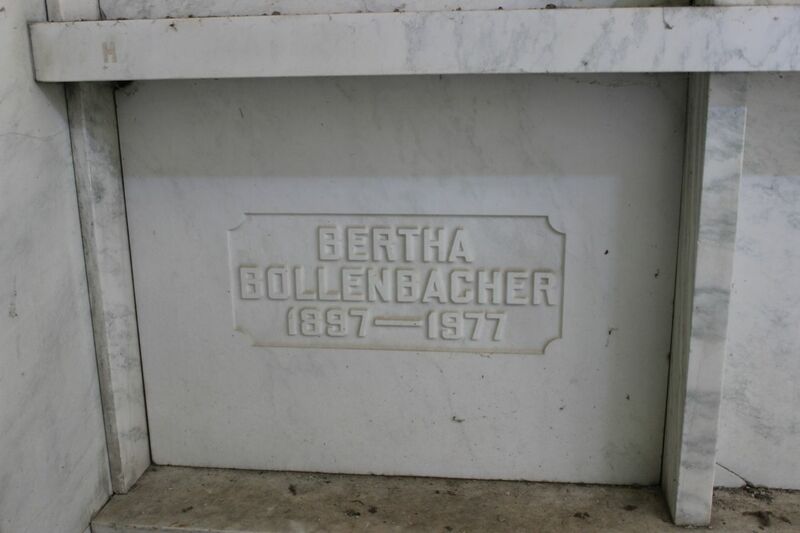 Bertha’s mother Mary (Kessler) Huffman died from complications of childbirth on 5 October 1908. Bertha was only 11 years old and her mother was only 33 years old. Bertha Huffman married Samuel Abraham Bollenbacher on 18 November 1937 in Mercer County, Ohio. Neither had been married before. Samuel, 65, was retired and Bertha, 40, was a housekeeper. They were married by Rev. H.F. Holtmeyer, the pastor of Grace Lutheran Church in Fort Wayne, Indiana. Samuel was the son of George (1830-1912) and Anna Barbara (Albrecht) Bollenbacher (1836-1913), born 22 July 1872 in Mercer County, Ohio. Samuel and Bertha had only been married seven years when Samuel died on 2 April 1945 near Chatt. He was 72 years old. According to Zion Chatt’s records he died of pneumonia and was buried on the 5th. He was survived by his wife Bertha and his brother Edward. He is buried in the Chattanooga Mausoleum next to Bertha. Bertha died 3 June 1977 in Coldwater, Mercer County, Ohio. She was buried on the 6th. No cause of death was given in the church records. She was survived by a brother and four sisters. Celina—Bertha Bollenbacher, 79, died at 8:42 a.m. Friday in Coldwater Community Hospital. Survivors include a brother, Roman of Willshire; four sisters, Mrs. Fronie Green of Ft. Recovery, Clara Hofstetter of Geneva, Ind., Lucille Agler of Fillmore, Calif, and Rosella Huffman of Rt. 3, Rockford. 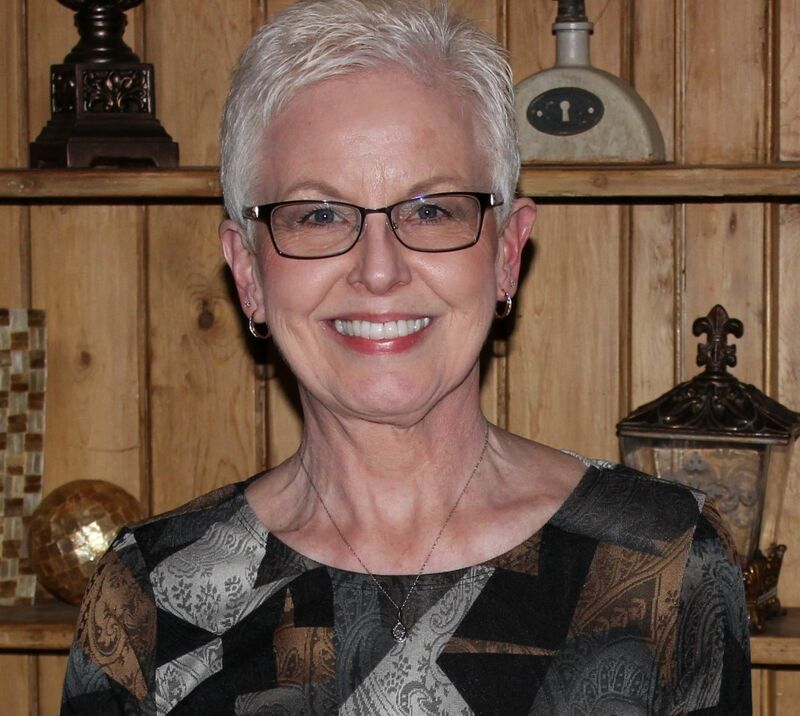 Funeral services will be at 1:30 p.m. Monday in Ketcham-Rilpey Funeral Home, Rev. Ralph Hershberger officiating. Burial will be in the mausoleum in Chattanooga. 1900 U.S. Census, Liberty, Mercer, Ohio, ED 85, p.9A, dwelling 165, family 170, Jacob Hoffman; Ancestry,com; FHL microfilm 1241304, NARA microfilm T623, roll 1304. 1910 U.S. Census, Liberty, Mercer, Ohio, ED 119, p.16A, dwelling 343, family 303, Jacob Huffman; Ancestry.com; FHL microfilm 1375227, NARA microfilm T624, roll 1214. 1920 U.S. Census, Liberty, Mercer, Ohio, ED 140, p.10A, dwelling 194, family 210, Jacob Hoffman; Ancestry.com; NARA microfilm T625, roll 1418. “Ohio, County Marriages, 1789-2013,” database with imags, FamilySearch.org, Samuel A Bollenbacher & Bertha M Huffman, 18 Nov 1937; Mercer County Marriages, Vol. 15, p.90, FHL microfilm 2366956. 1940 U.S. Census, Liberty, Mercer, Ohio, ED 54-22, p.4A, line 20, family 68, Sam Bollenbacher; FamilySearch.org; FHL microfilm 5460643, NARA microfilm T627, roll 3114. 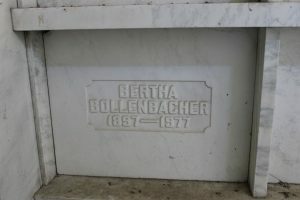 Bertha (Huffman) Bollenbacher obituary, The Lima News, 4 June 1977, p.4 Lima News; digital image, Ancestry.com.